PhotoPedagogy is a tremendous resource with a simple goal: to help photography teachers exchange ideas. Unsettled by reports that arts courses in the UK were being "squeezed out of schools", founders Chris Francis and Jon Nicholls, both photography teachers themselves, launched the site in 2015 to start a conversation about why and how photography should be taught. It turns out lots of teachers wanted to join that conversation. 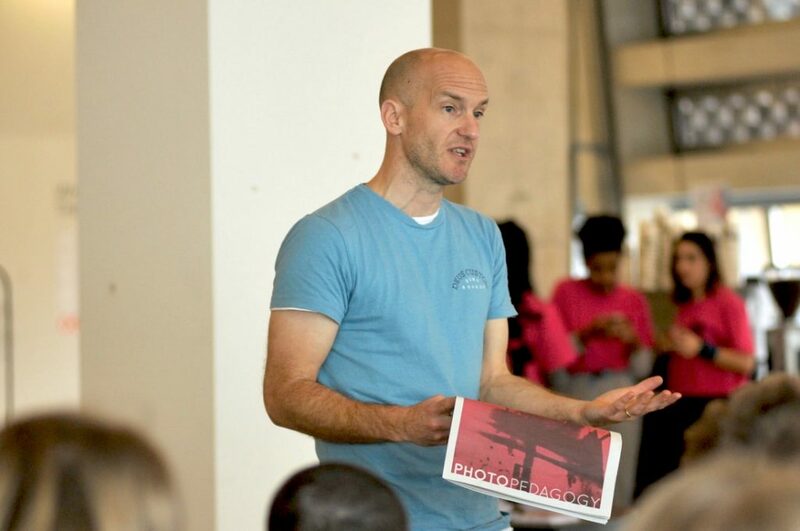 Collaborating with photography educators (and students) across the country, PhotoPedagogy has built a huge database of free resources – from lesson plans to reading lists to innovative games. PhotoPedagogy also organises events and workshops to share this knowledge offline. 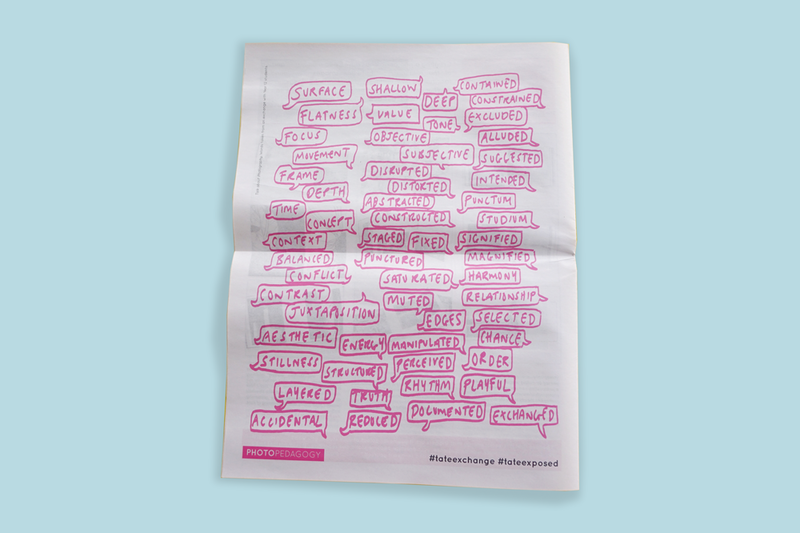 For a recent project at Tate Modern, they printed a traditional tabloid on the theme of "exchange" – and we've picked it for our Newspaper of the Month! 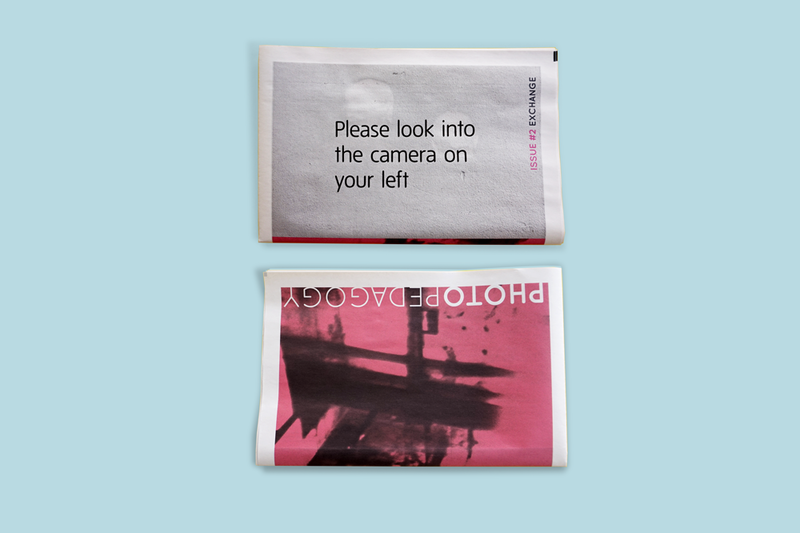 You can flip through the newspaper, which includes playful prompts for photographing in gallery spaces, in The Newsagent. In the interview below, PhotoPedagogy's founders tell us more about the event and why print plays an important role in the history of photography. PhotoPedagogy at #TateExposed hosted at Tate Modern. Why did you start a PhotoPedagogy zine – and why in newsprint? Producing a newspaper provides a great excuse to collaborate, and to think, write and share about photography. This is what we love to do and is the essence of all of our PhotoPedagogy work. We are also great believers in experimenting and simply trying things out. Publishing in newsprint was appealing for lots of reasons, not least being an affordable, democratic medium that allowed us to play with the design. 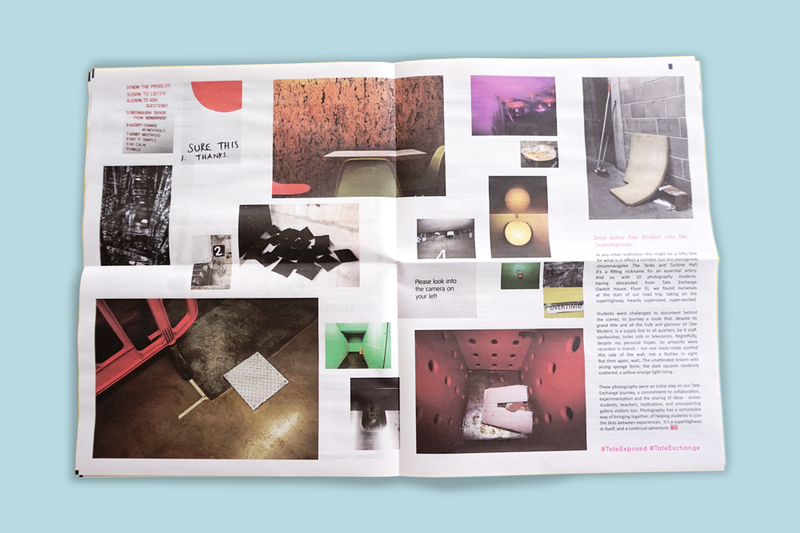 Issue 2 of PhotoPedagogy traditional tabloid newspaper. The theme of this issue is "Exchange." Where do you think photobooks/zines fit into this idea? 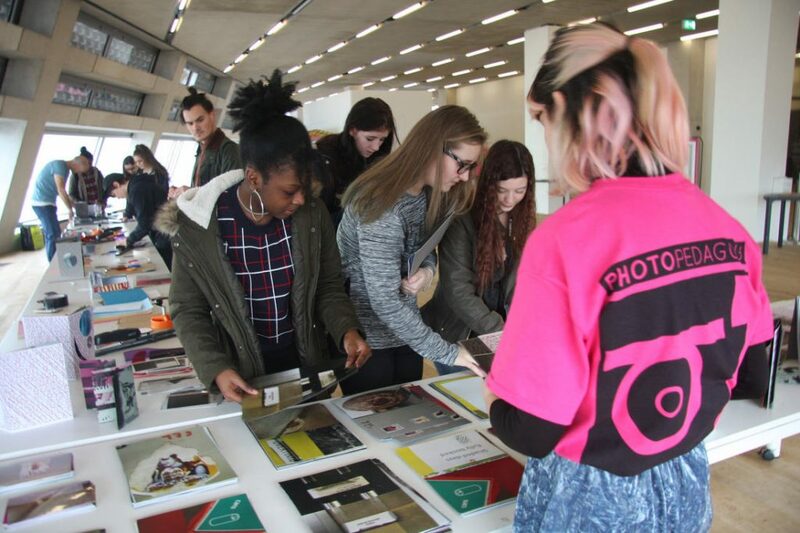 This issue was produced in support of our Tate Exchange project (hosted at Tate Modern on 6th February 2017) where we invited gallery visitors to engage with some of the "big ideas" in photography education. Working alongside our students we created a range of activities and prompts designed to provoke various exchanges including a photobook/zine making activity. Visitors were challenged to construct their own books from given images – combining pages, manipulating, collaging, puncturing photographs etc. These acts of making, facilitated numerous exchanges – between visitors and artworks, students and teachers, across the pages and images themselves, and so on. More broadly, we are keen to remind our students of the central importance of print technology in the history of photography. We encourage them to make their own publications – zines and photobooks – as a way of engaging in the vibrant culture of self-publishing. This exchange of inexpensively produced, often handmade, publications between photo enthusiasts is central to the medium. Digital technologies, far from threatening print publishing, have provided a means for everyone to make their own zines and books through print on demand services like Newspaper Club. This is the second newspaper you've printed with us. What did you learn in the process of making the first issue, and did you do anything differently this time around? The first issue was printed digitally, the second on traditional press, so there were important considerations in setting up for print. Newspaper Club were brilliant here, highlighting potential problems and sharing tips. We initially followed our original template, but having many more contributors provided new challenges and an increased sense of responsibility to do their words and images justice. Perhaps one of the most enjoyable aspects of designing or curating with photographs is thinking about the relationships between images. The temptation can be to try to include every picture that appeals, but there’s something to be said for making limited selections, allowing interesting connections to emerge across images, and between images and text too. 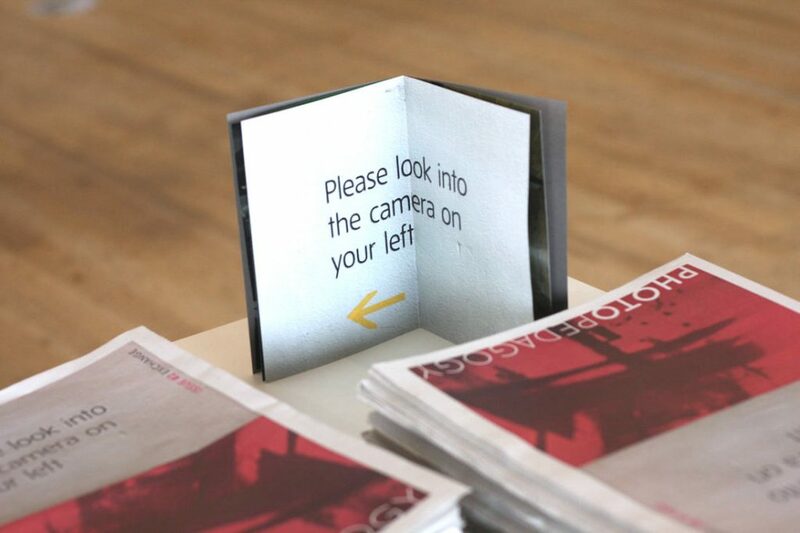 PhotoPedagogy has explored the role of photobooks in the history of photography. How do you see this changing over the next few years? We imagine many more people will embrace the technology available to get involved in self publishing, and many more great ideas will find outlets. Photobooks are becoming extremely collectible and are works of art in their own right. Alongside the self-publishing print on demand revolution there will continue to be a demand for high quality, expensive and limited-edition photobooks for collectors and museums. New technologies may be able to create digital photobooks that are innovative and multimedia creations of astounding beauty but they won't replace the experience of the printed version. PhotoPedagogy event at #TateExposed hosted at Tate Modern. Finally, what's next for PhotoPedagogy and the PhotoPedagogy zine? We are keen to engage more photography teacher colleagues in contributing their experiences, knowledge and insights to the website. We have exciting plans to collaborate with Tate (again), The Photographers’ Gallery and Photoworks. We want to find ways for more photography students to take an active and leading role in these projects. We’re not sure what the next edition of the PhotoPedagogy zine will be about but we hope to develop some of the links we’ve made with leading photographers and cultural organisations and celebrate the skills and creativity of young photographers. Buy Issue 2 of the PhotoPedagogy newspaper in The Newsagent for £5.50.